The Corinth Canal (Greek: Διώρυγα της Κορίνθου, translit. Dhioryga tis Korinthou) connects the Gulf of Corinth with the Saronic Gulf in the Aegean Sea. It cuts through the narrow Isthmus of Corinth and separates the Peloponnese from the Greek mainland, arguably making the peninsula an island. The canal was dug through the Isthmus at sea level and has no locks. It is 6.4 kilometres (4 mi) in length and only 21.4 metres (70 ft) wide at its base, making it impassable for most modern ships. Nowadays it has little economic importance and is mainly a tourist attraction. The location of the Isthmus of Corinth; the modern canal is shown in light blue. Several rulers of antiquity dreamed of digging a cutting through the isthmus. The first to propose such an undertaking was the tyrant Periander in the 7th century BC. The project was abandoned and Periander instead constructed a simpler and less costly overland portage road, named the Diolkos or stone carriageway, along which ships could be towed from one side of the isthmus to the other. Periander's change of heart is attributed variously to the great expense of the project, a lack of labour or a fear that a canal would have robbed Corinth of its dominant role as an entrepôt for goods. Remnants of the Diolkos still exist next to the modern canal. The Diadoch Demetrius Poliorcetes (336–283 BC) planned to construct a canal as a means to improve his communication lines, but dropped the plan after his surveyors, miscalculating the levels of the adjacent seas, feared heavy floods. The philosopher Apollonius of Tyana prophesied that anyone who proposed to dig a Corinthian canal would be met with illness. Three Roman rulers considered the idea but all suffered violent deaths; the historian Suetonius writes that the Roman dictator Julius Caesar considered digging a canal through the isthmus but was assassinated before he could begin the project. Caligula, the third Roman Emperor, commissioned a study in 40 AD from Egyptian experts who claimed incorrectly that the Corinthian Gulf was higher than the Saronic Gulf. As a result, they concluded, if a canal were dug the island of Aegina would be inundated. Caligula's interest in the idea got no further as he too was assassinated before making any progress. The emperor Nero was the first to attempt to construct the canal, personally breaking the ground with a pickaxe and removing the first basket-load of soil in 67 AD, but the project was abandoned when he died shortly afterwards. The Roman workforce, consisting of 6,000 Jewish prisoners of war, started digging 40–50-metre-wide (130–160 ft) trenches from both sides, while a third group at the ridge drilled deep shafts for probing the quality of the rock (which were reused in 1881 for the same purpose). According to Suetonius, the canal was dug to a distance of four stades – approximately 700 metres (2,300 ft) – or about a tenth of the total distance across the isthmus. A memorial of the attempt in the form of a relief of Hercules was left by Nero's workers and can still be seen in the canal cutting today. Other than this, as the modern canal follows the same course as Nero's, no remains have survived. The Greek philosopher and Roman senator Herodes Atticus is known to have considered digging a canal in the 2nd century AD, but did not get a project under way. The Venetians also considered it in 1687 after their conquest of the Peloponnese but likewise did not initiate a project. The idea of a canal was revived after Greece gained formal independence from the Ottoman Empire in 1830. The Greek statesman Ioannis Kapodistrias asked a French engineer to assess the feasibility of the project but had to abandon it when its cost was assessed at 40 million gold francs—far too expensive for the newly independent country. Fresh impetus was given by the opening of the Suez Canal in 1869 and the following year, the government of Prime Minister Thrasyvoulos Zaimis passed a law authorizing the construction of a Corinth Canal. French entrepreneurs were put in charge but, following the bankruptcy of the French company that had attempted to dig the Panama Canal, French banks refused to lend money and the company went bankrupt as well. A fresh concession was granted to the Société Internationale du Canal Maritime de Corinthe in 1881, which was commissioned to construct the canal and operate it for the next 99 years. Construction was formally inaugurated on 23 April 1882 in the presence of King George I of Greece. The company's initial capital was 30,000,000 francs (USD$6.0 million in the money of the day), but after eight years of work it ran out of money and a bid to issue 60,000 bonds of 500 francs each flopped when less than half of the bonds were sold. The company's head, István Türr, went bankrupt, as did the company itself and a bank that had agreed to raise additional funds for the project. Construction resumed in 1890 when the project was transferred to a Greek company, and was completed on 25 July 1893 after eleven years' work. The Inauguration of the Corinth Canal (1893) by Konstantinos Volanakis. The canal experienced financial and operational difficulties after completion. The narrowness of the canal makes navigation difficult. Its high walls channel wind along its length, and the different times of the tides in the two gulfs cause strong tidal currents in the channel. For these reasons, many ship operators were unwilling to use the canal, and traffic was far below predictions. Annual traffic of just under 4 million net tons had been anticipated, but by 1906 traffic had reached only half a million net tons annually. By 1913 the total had risen to 1.5 million net tons, but the disruption caused by World War I resulted in a major decline in traffic. Another persistent problem was the heavily faulted nature of the sedimentary rock, in an active seismic zone, through which the canal is cut. The canal's high limestone walls have been persistently unstable from the start. Although it was formally opened in July 1893 it was not opened to navigation until the following November, due to landslides. It was soon found that the wake from ships passing through the canal undermined the walls, causing further landslides. This required further expense in building retaining walls along the water's edge for more than half of the length of the canal, using 165,000 cubic metres of masonry. Between 1893 and 1940, it was closed for a total of four years for maintenance to stabilise the walls. In 1923 alone, 41,000 cubic metres of material fell into the canal, which took two years to clear out. Serious damage was caused to the canal during World War II. On 26 April 1941, during the Battle of Greece between defending British troops and the invading forces of Nazi Germany, German parachutists and glider troops attempted to capture the main bridge over the canal. The bridge was defended by the British and had been wired for demolition. The Germans surprised the defenders with a glider-borne assault in the early morning of 26 April and captured the bridge, but the British set off the charges and destroyed the structure. Other authors maintain that German pioneers cut the detonation wires, and a lucky hit by British artillery triggered the explosion. Three years later, as German forces retreated from Greece, the canal was put out of action by German "scorched earth" operations. German forces used explosives to trigger landslides to block the canal, destroyed the bridges and dumped locomotives, bridge wreckage and other infrastructure into the canal to hinder repairs. The United States Army Corps of Engineers began to clear the canal in November 1947 and reopened it for shallow-draft traffic by 7 July 1948, and for all traffic by that September. The canal consists of a single channel 8 metres (26 ft) deep, excavated at sea level (thus requiring no locks), measuring 6,343 metres (20,810 ft) long by 24.6 metres (81 ft) wide at the top and 21.3 metres (70 ft) wide at the bottom. The rock walls, which rise 90 metres (300 ft) above sea level, are at a near-vertical 80° angle. The canal is crossed by a railway line, a road and a motorway at a height of about 45 metres (148 ft). In 1988 submersible bridges were installed at sea level at each end of the canal, by the eastern harbour of Isthmia and the western harbour of Poseidonia. Although the canal saves the 700-kilometre (430 mi) journey around the Peloponnese, it is too narrow for modern ocean freighters, as it can accommodate ships only of a width up to 17.6 metres (58 ft) and draft up to 7.3 metres (24 ft). Ships can pass through the canal only one convoy at a time on a one-way system. Larger ships have to be towed by tugs. The canal is currently used mainly by tourist ships; around 11,000 ships per year travel through the waterway. ^ Facaros, Dana; Theodorou, Linda (1 May 2003). Greece. New Holland Publishers. p. 172. ISBN 978-1-86011-898-2. Retrieved 24 July 2011. ^ a b Suetonius. "C. Suetonius Tranquillus, Nero, chapter 19". www.Perseus.Tufts.edu. Retrieved 25 July 2017. ^ Facaros, Dana; Theodorou, Linda (2008). Peloponnese & Athens. New Holland Publishers. pp. 155–156. ISBN 978-1-86011-396-3. ^ Arafat, K. W. (2004). Pausanias' Greece: Ancient Artists and Roman Rulers. Cambridge University Press. p. 151. ISBN 978-0-521-60418-5. ^ Wiseman, James (1978). The land of the ancient Corinthians. P. Åström. p. 50. ISBN 978-91-85058-78-5. ^ Setton, Kenneth Meyer (1991). Venice, Austria, and the Turks in the seventeenth century. American Philosophical Society. p. 344. ISBN 978-0-87169-192-7. ^ a b "The Countdown". Retrieved 25 July 2011. ^ a b Johnson, Emory Richard (1920). Principles of Ocean Transportation. New York: D. Appleton. pp. 99–102. ^ "Geology and Ancient Culture Along the Corinth Canal Archived 17 January 2008 at the Wayback Machine"
^ Mrazek, James (2011). Airborne Combat: Axis and Allied Glider Operations in World War II. Stackpole Books. pp. 49–55. ISBN 978-0-8117-0808-1. ^ 108 Blau, George E. (1986) . The German Campaigns in the Balkans (Spring 1941) (Reissue ed.). Washington, D.C.: United States Army Center of Military History. CMH Pub 104-4. ^ Absprung über dem Isthmus, Hans Rechenberg, in: Wir kämpften auf dem Balkan: VIII Fliegerkorps. Dr. Güntz-Druck, Dresden. 1941. ^ Robert P. Grathwol; Donita M. Moorhus (2010). Bricks, Sand, and Marble: U.S. Army Corps of Engineers Construction in the Mediterranean and Middle East, 1947–1991 (PDF). Government Printing Office. p. 13. ISBN 978-0-16-081738-0. 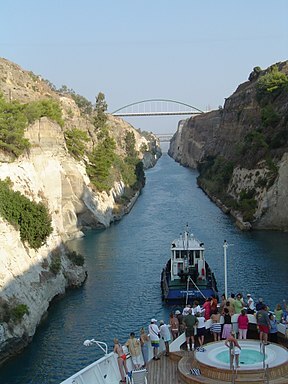 ^ "Corinth Canal". Aedik.gr. Retrieved 25 July 2011. ^ Carydis, Panayotis G.; Tilford, Norman R.; Brandow, Gregg E.; Jirsa, James O. (1982). The Central Greece earthquakes of February–March 1981. Washington, D.C.: National Academy Press. p. 79. ^ a b Goette, Hans Rupprecht (2001). Athens, Attica, and the Megarid: An Archaeological Guide. Routledge. p. 322. ^ Bowman, Carol L. (February 2014). "The Corinth Canal". International Travel News. p. 12. Wikimedia Commons has media related to Corinth Canal.